This entry was posted on June 29, 2012 by Robyn Lee. It was filed under Summer 2012 and was tagged with beauty, details, distance, focus, frailties, grace, healing, health, indentations, isolation, judgement, meditation, nature, pain, perception, photography, richness, Robyn Lee, sand, sea shells, searching, shore, spirit, still life, textures, vision. You could get some bread and make a sandwich. Oh my, I am trying to be funny but think it is time to have an early night and go to bed. It is an attractive photo with great texture and colour. Good night Robyn. I need to put in some beach time!!! 🙂 Glad my image could serve as the reminder Kathy — amazing how they can spark these awarenesses !! Great image Robyn – I love it. Looks like you can get lower down than me these days. I’m getting really stiff at home on these wet, winter days. 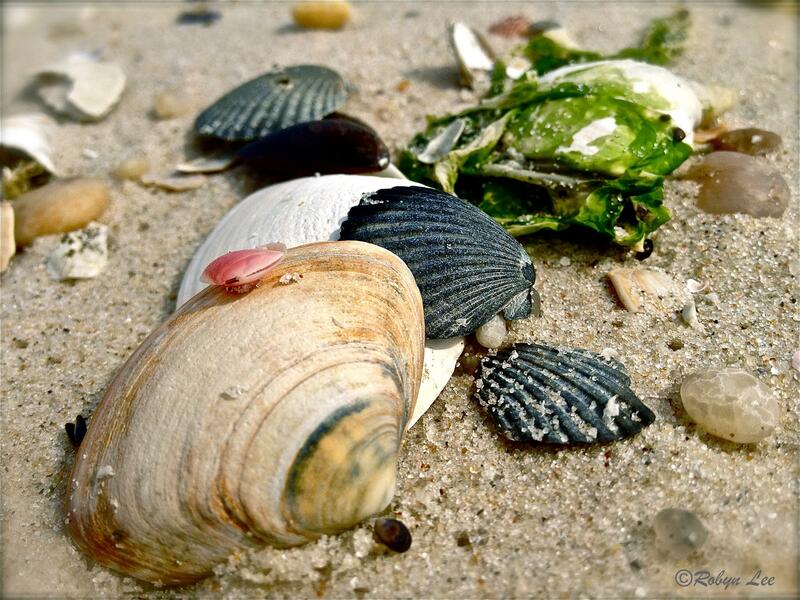 I doubt if I will be able to lie down on the beach to take photos of shells & waves next summer. I love close-up images of sea shells. This lovely post and your quote has a deep meaning for me – To bring about lasting change in ourselves and in others our actions must be imperceptible! Many thanks Robyn for sharing! Robyn, Nice photo. I have the worlds largest collection of sea shells. I keep them by the beach. Looks like you found a few of them. Don’t be confused by my silliness. I am enjoying my weekend, terribly hot here, but expected for this time of year. Hope you have a grand 4th and celebrate our Indpendence Day in style!. A wise old photographer friend of mine once referred to such shots as “understated landscapes”. Shots that take a keener eye to see. Well done. So, so true Robyn. Thank you for sharing with us the most intricate of beautiful details in these sea shells. How often we need to remind ourselves that many blessings may seem miniscule, but they are there, still as blessings in all their beauty and glory. Very nice shot — makes me long to have my toes in the sand . . . ! Appreciate so much KT! I am glad you enjoyed. Very true… it’s the smaller things that we often miss if we don’t remember to make the time to take a closer look. Yes — the sand here is really inviting…xo How are things in CO re: fires? This quote is so true Robyn.